Wimborne-bred singer/songwriter Roo Panes cites his Dorset roots and his love of the nearby Lake District as key to his inspiration for new LP ‘Paperweights’. In the album’s press release, he speaks of “the peace, the silent solitude, [the] pastoral warmth . . . that couldn’t have manifested within urban limits”. His earthy, organic folk style will appeal to fans of Nick Mulvey, though Panes sticks to a more traditionally British, less globally-influenced track. Indeed, the larger themes on ‘Paperweights’ likely did require some harnessing. These are songs about heartache, forgiveness and eternal love, topics which on one hand could easily become trite, on the other potentially over-affected and pedantic. Panes strikes a fine balance between the head and the heart, with poetry and musical interpretations that appeal to both. The album opens with the unassuming plucked guitar strains of ‘Stay With Me’, where Panes tenderly assures us in the chorus that “you’re right where you are supposed to be” ahead of delicately layered vocal lines in the song’s coda. In ‘Corner of My Eye’, he takes on the idea of unrequited love, making a well-worn idea newly eloquent in his delivery of the lyric “I’ve noticed that your star shines brightest / when seen out of the corner of my eye / and when I look at you, you vanish / maybe I’m just blinded by your light”. Bowed strings and subtle woodwinds sweep along behind the vocals, creating lush, intricate harmonies under the steady momentum of the guitar rhythm. Panes’ falsetto shines in the chorus of ‘Water Over Fire’, mixing vivid emotion with elegant restraint. The song itself is bit deceptive on first listen, its sensual rhythm and passionate vocal delivery spicing up lyrics about unexpected forgiveness, as Panes explains in this interview with music magazine Relix. Continuing the album’s preoccupation with nature, ‘Summer Thunder’ paints its textual imagery (“summer thunder, come again / you’re hard to wish away / I just keep on driftin’ with your rain”) with a subtly shifting melodic rhythm and a restless brass descant. The bass-heavy groove of ‘Where I Want to Go’ closes the album proper on an upbeat note, but astute listeners will notice a hidden track tacked onto the end of it. Older favourite song ‘Awoken’ is tucked away here like a secret treasure, carefully squirreled away for just the right moment. Its chorus lyric “I know I said tomorrow will be better than today / I guess I’m just beginning to learn the way” echoes through as if from a distance, leaving only the impression of Panes’ exquisite vocal delivery in its wake. 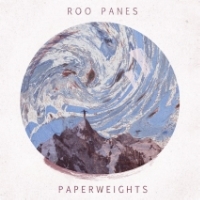 Roo Panes’ second album ‘Paperweights’ is out today and now available from CRC Records. Stay tuned to TGTF for a review of Panes’ upcoming SXSW 2016 appearance; our previous coverage of Roo Panes is back this way.